You're putting out client fires, fixing internal resource needs, doing some marketing for the agency, and even finding ways to fix talent retention issues. As an agency owner, you can do it all. The problem occurs when you are also responsible for bringing in new business. Sales should be viewed as an immediate need, but building relationships and making calls won't ever be prioritized over an issue that needs to be resolved right now. This approach is why many agencies find themselves scrambling — even desperate — for new accounts. Because they don't have someone whose sole purpose and focus is on creating a sustainable, scalable new business program for the agency, they miss the signs that their growth has stagnated or that they are on target to miss their revenue goal for the year. Rick Kranz, founder of OverGo Studio, found himself in a similar situation and decided to hire a new business sales rep to grow the business faster and in a much more predictable way. Previously, Kranz had worked at a display manufacturing firm, and in this position, he had rapidly scaled the sales team to handle a large number of internet leads. There was a problem with the business development compensation structure at that firm, which also applied to the retainer-based revenue model of his current agency. Initially, the sales team was paid with a commission plan, which worked for a while. But the company was working with Starbucks and other franchises that were rapidly expanding, so most of the work was repeat business. When the company started paying out commissions based on recurring business, financial issues with the model became clear. “We couldn’t align our business goals with sales compensation model,” Kranz said. He couldn't tie the behavior of sales reps to incentives, and the recurring business and percentage-based sales commission structure was destroying the company's margins. They create a zero sum game mentality where sales reps are only concerned about the percentage they get from a sale. They create a sense of entitlement on recurring revenue accounts. It's difficult to change percentage commissions once they are established. They may discourage constant improvement in performance. And the biggest problem is: What percentage commission is going to be good for your agency? To calculate a commission rate that works for your agency, you need to first understand what your gross profit margin and net profit margins are. But the current state of affairs isn't the only thing to consider. What will these numbers look like in two years? In three years? As an agency matures -- as it grows from a one-person to a two-person to a 20-person shop -- its margins also mature. You might go from 60% to 40% to a more realistic 15% net profit margin. When you are operating at a 60% profit margin, it might seem logical, even in your best interest, to set up a compensation model that provides a 10% or 15% commission to a new business professional. But this doesn’t work as you add more overhead and decrease your net profit margin. Your services only scale by adding more people or through outsourcing -- agencies can't benefit from the software model. You have to "make" more stuff to sell. Here's an example: let's say you’ve just hired a new business professional. She is a perfect sales hire. She has the success traits you were looking for, she is a culture fit, and she passed your test on the mental weaknesses to avoid in a sales hire. You're ready to scale your agency and bring in more valuable client accounts. But what is it really worth the first year? Realistically, it is going to take at least three months for the person to make her first sale. During the first 90 days, she is training. Then, you have to factor in your average sales cycle, which could be 30 days or even six months. It will also take time for the person to build up a pipeline to be at full productivity. Let’s call our perfect new hire Beth. 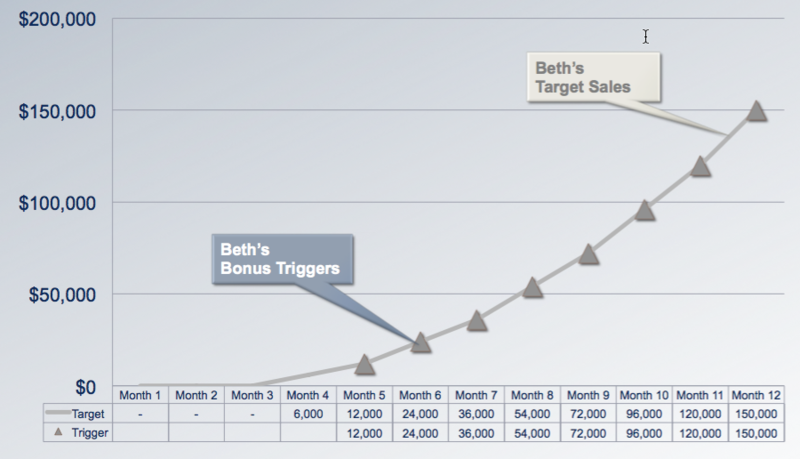 If Beth makes her first sale in month four, the earned revenue you will actually see in the first year is $150,000 -- less than half of your new business revenue goal. Do you pay a 10% commission -- $15,000 -- on an achievement where a person didn't meet their goals? And what do you do when the remaining $210,000 hits your books? How do you handle renewals and commissions? You need a collaborative model. The thing to remember about hiring a new business sales rep is that for the first year, you are really making an investment in a person and their ability to not only secure new clients but to bring on clients that will renew their retainer contracts. The first year of a sales rep's tenure at your agency isn't going to change your client roster too drastically. 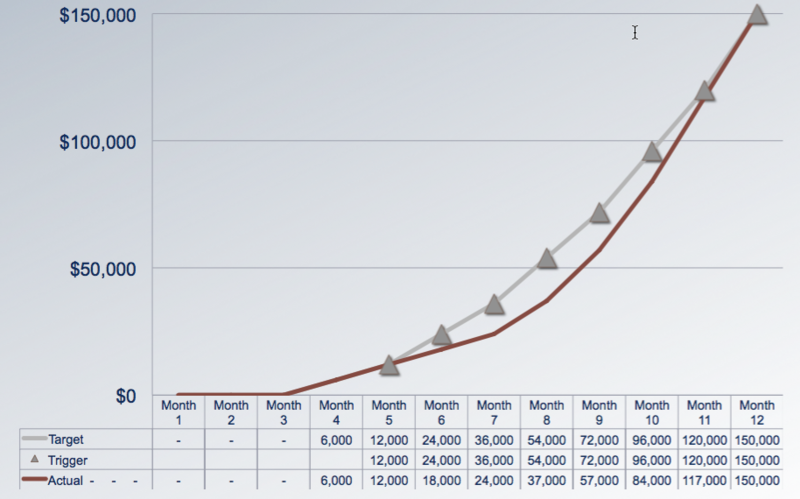 So you need to adjust your goals based on what the person can actually sell within the first 12 months. How much does the sales person want to make? How much does the person need for survival? What’s the base salary you can provide? What bonuses can be provided? This should be based in reality, but it also needs to be reflective of what the person needs to make them happy. Happy sales reps work harder, and again, you are investing for the future. You want this person to stay beyond a year. How much does the person need to survive? You need to understand what a person requires to eat and feed their family, so that you can provide proper incentive but remove debilitating fears. This number should be close to the “survival” rate. A sales team bonus structure should be tied to performance, and should get the sales rep close to their “want” salary number. The person has enough to survive, but she also is provided with a clear plan for achieving her personal income goals. 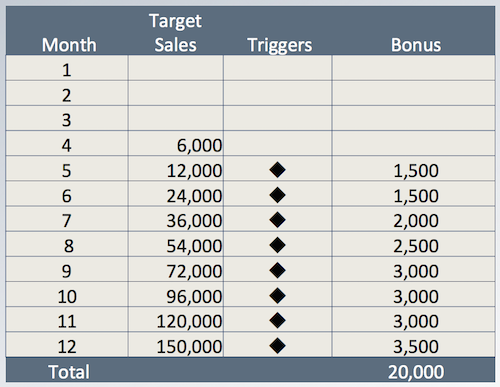 Here's a sample plan where 60% of the sales rep's commission is base salary and 40% is based on a bonus. You might be thinking: well, isn’t a bonus of $20,000 basically a 13% commission? Yes, and no. Instead of commission based on each sale, OverGo Studio sets triggers and targets that incentivize the person to hit their goals. This protects the agency from taking a huge financial hit while it is investing in a new hire -- triggers during the early part of the year are smaller than those aligned with months 8 to 12. It also encourages the person to hit her goals during the last part of her first year -- after she has been trained properly. “You should build reporting around what a sales rep should achieve and share this with your team. It gives the person a sense of ownership, provides accountability, and clarifies what the expectations are,” Kranz said. 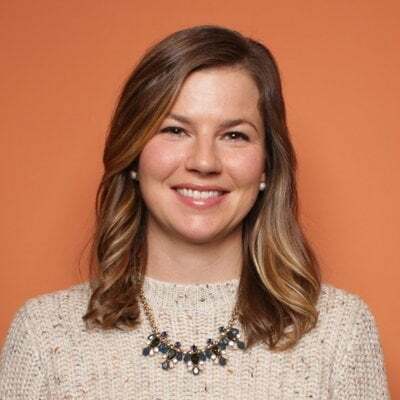 When we look at a 12-month review of Beth's sample plan, she has actually hit her revenue target for the year, even though she was behind on her goals in months 6 to 10. Because she hit her target, there is a remaining balance of $246,000 on retainers that will be paid during year two. Now, let’s look at how the collaborative model works when retainers begin to renew and Beth is at full productivity. If you were working under a commission plan, you would end up paying out 10% on $767,000, a total of new sales, contract balances from year one, and renewals. You can see why percentage compensation is an issue now. For a business development incentive compensation structure to grow the business and keep employees happy, you continue to go back to your need to survive, base, bonus, and target compensation chart. OverGo added in triggers for contract renewals -- 20% of the bonus now comes from contract renewals -- so she is compensated based on recurring revenue from loyal clients. 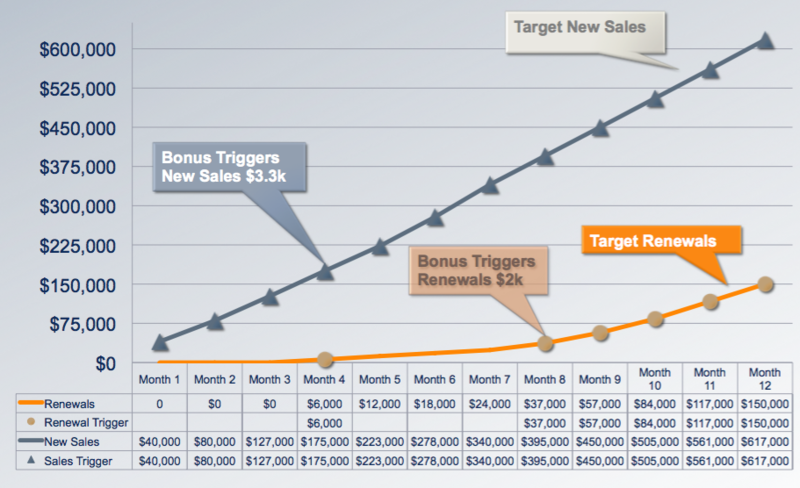 Again, the bonus triggers for new accounts are spread out across the next 12 months to provide ongoing incentives. Having a creative compensation plan that both works for your agency and your new business team isn’t easy. Everyone has a way that they want it to work out, and each party has their own priorities. In the end, it is about creating a solid, logical plan that gets buy-in from the sales hire. She understands why and how she will be compensated and is given the opportunity to voice her needs. The key is in creating alignment across all departments. When your new business team succeeds in doing what you hired them to do, the entire company is propelled forward.